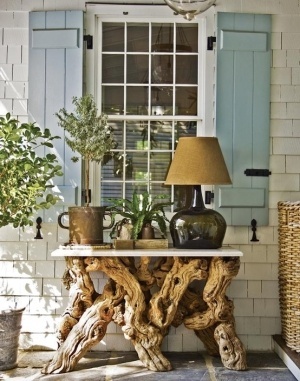 When designing an outdoor space, I always like to include a console table. The console table, on its off time, serves as a place for a lantern, potted plant, and an interesting object or two (as in the photo above). However, when there is entertaining going on, the console becomes the perfect place for food & drink. 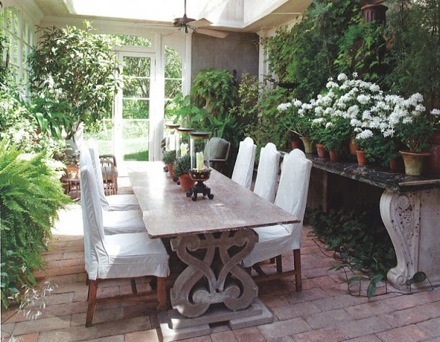 A great example of this, is Bunny Williams’ patio area. She has a lovely huge console table that can easily transform into a buffet table when entertaining. 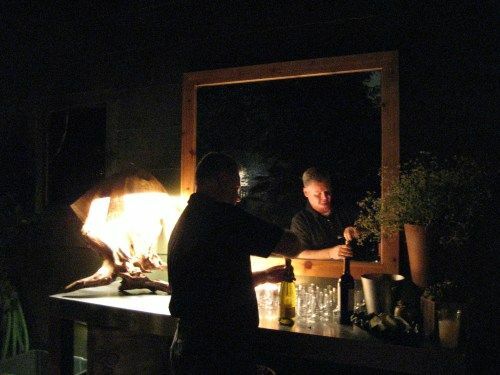 Here, for a friend’s garden, I had a potting table and mirror made for the patio area. When entertaining, the table becomes the perfect place for beverages and food, otherwise, it displays the owner’s fabulous plants and objects. The table you use for you buffet doesn’t necessarily have to be a proper console table, you could use an old picnic table, potting table, small bistro table or even your outdoor coffee table — it all depends on your needs/space. 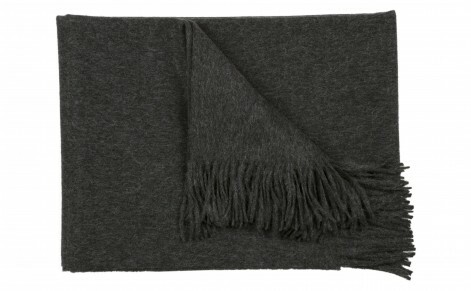 A good reading lamp, soft sheets and a cozy blanket provide a sense of comfort for those traveling far from home. Adding a box of chocolates and good reading material is also a nice touch depending how long you wish your guests to actually stay. For those of you living in smaller quarters, with a little imagination almost any part of your home could become a guest room. Once, I turned the dining room of our tiny Venice bungalow into a guest room for a friend staying for a week. 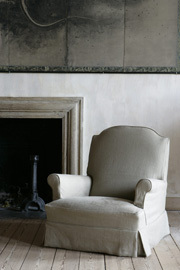 Whether your home is large or small the 8 items suggested below could apply to any size abode. It’s all about one’s attitude — being flexible and working with what you have. 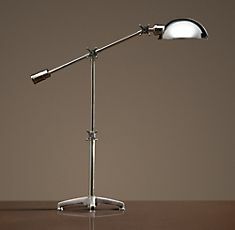 A task lamp to give the perfect light for late night reading. 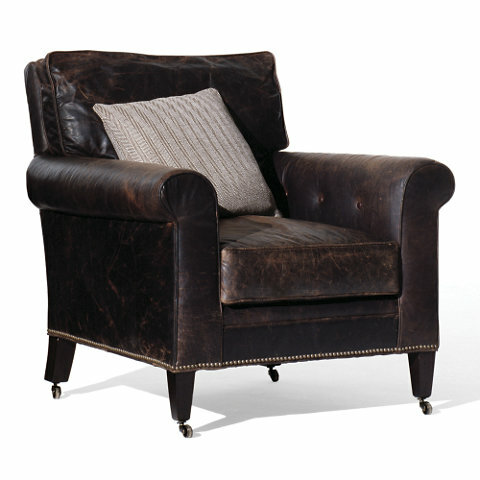 This one is from Restoration Hardware but Target and Lamps Plus have similar ones as well. A small bedside tray to house your guests jewelry, coins and spent candy wrappers. 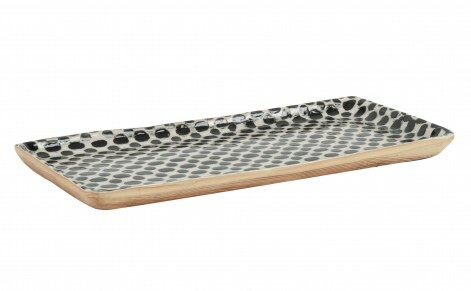 This “Dot Tray” is from Jayson Home & Garden. A nice smelling candle for the dresser. 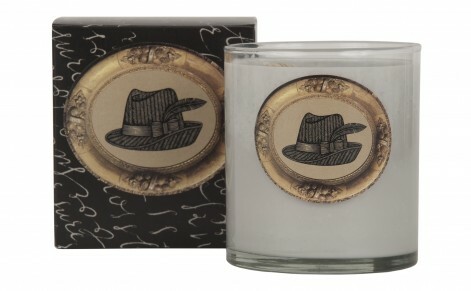 The Fedora Patch Candle is from Jayson Home & Garden. Fresh flowers or anything green from your garden (or supermarket). 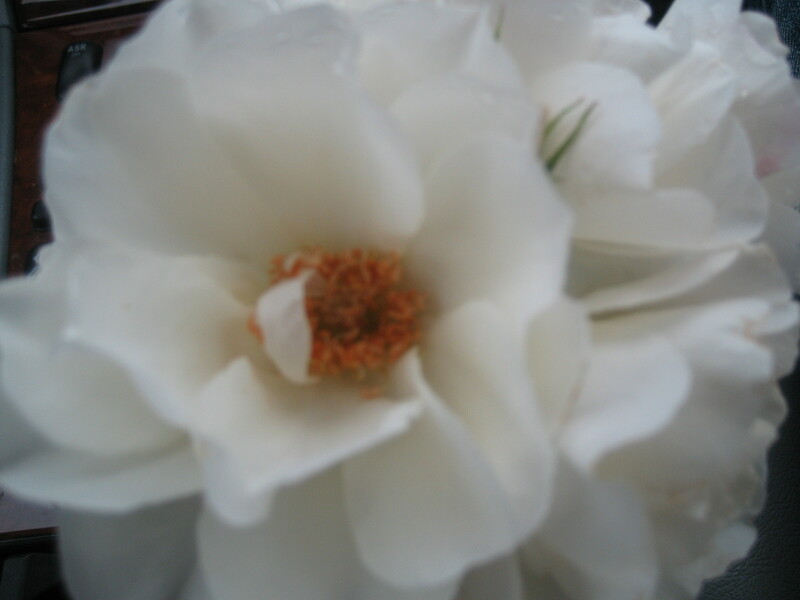 Another great thing to have when guest arrive is the aroma of something special on the stove or in the oven. 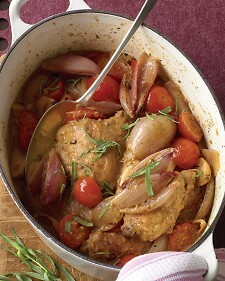 So, I have also included my favorite comfort dish recipe, Braised Chicken with Shallots. It’s great because you can make it the day before and just reheat when you are ready. 1. Season chicken with salt and pepper; coat with flour, shaking off excess. 2. In a Dutch oven or 5-quart pot with a tight-fitting lid heat oil over medium-high. Cook chicken until browned, 3 to 4 minutes per side. Remove and set aside. 3. Add shallots and garlic; cook, stirring occasionally, until slightly softened and golden brown, about 5 minutes. Add wine; cook until evaporated, 3 to 5 minutes. Stir in mustard and 1 1/2 cups water; bring to a boil. 4. Return chicken, bone side down, to pot. Reduce heat to a simmer, cover, and cook until chicken is tender and cooked through, 30 to 35 minutes. Transfer chicken to a plate; loosely tent with aluminum foil to keep warm. Add tomatoes to pot; season with salt and pepper. Cook on high until sauce has thickened, 6 to 8 minutes. Reduce heat to medium-low, and return chicken to pot; cook until heated through. 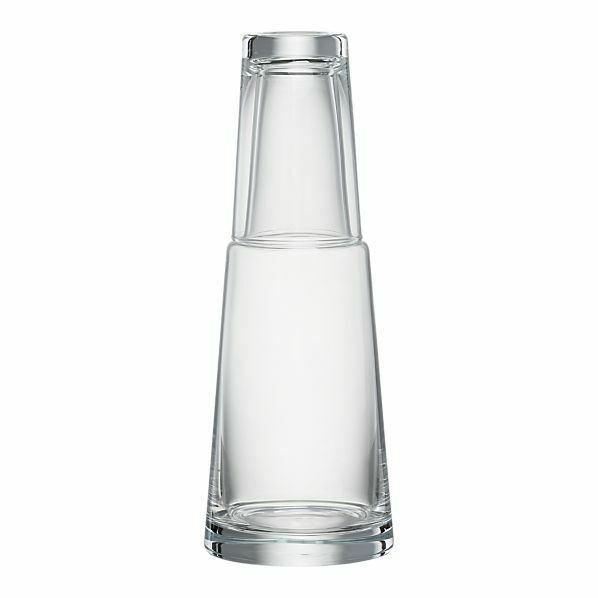 Serve, garnished with tarragon, if desired. 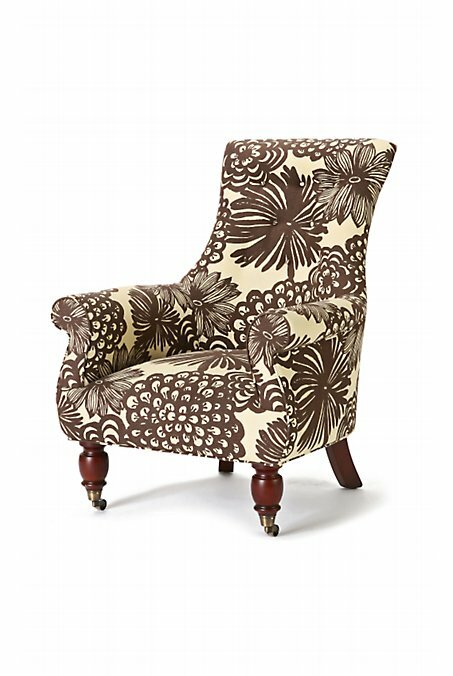 I love the idea of that one chair in the home that everyone would love to sit in, kind-of like “grandma’s chair”. 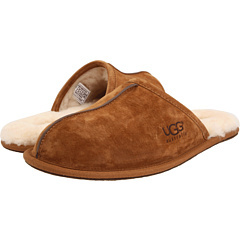 It’s worn just in the right places and when you see it, you automatically think “comfort”. 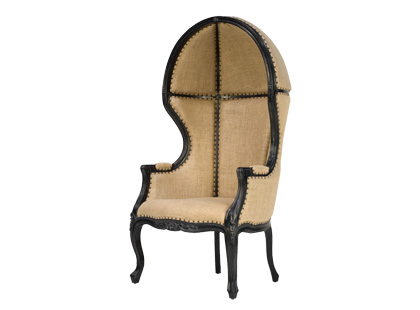 You could sit in this chair for hours and when you do — life seems at peace. 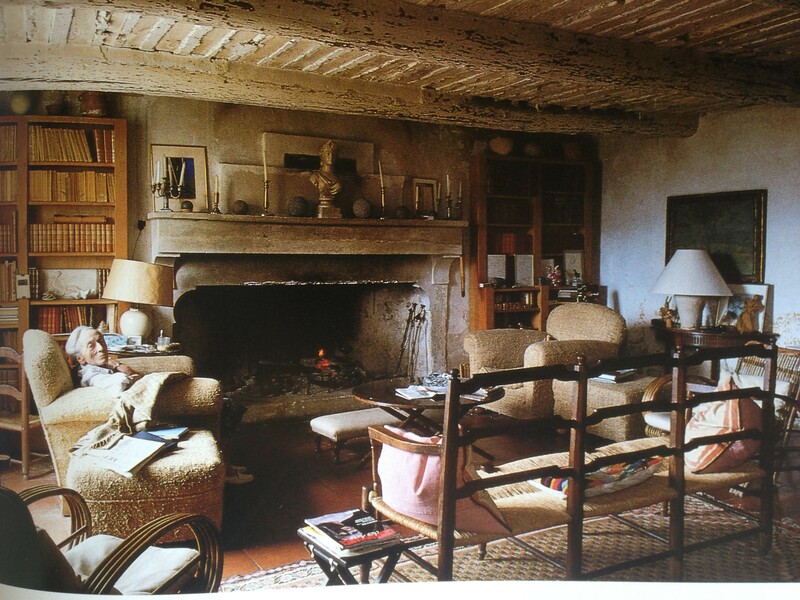 There is a photo from the book, Provence Interiors, (below) that I’ve always loved. 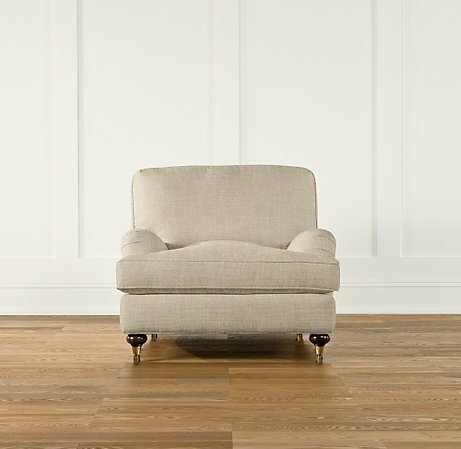 An older woman sits in a well-worn chair as she has probably done for years. When I see this picture I think how comfy and peaceful this room looks. A very cozy and comfortable room yet not lacking in taste or style. 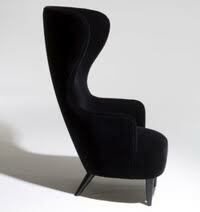 Unfortunately, I am without this type of chair myself and desperately want one. Therefore, I am on the hunt for one, my only criteria — that it’s extremely difficult to get myself out of. Below, are a few that have caught my eye.